I’m a fan of Silk soymilk products. Silk’s soymilk vanilla creamer is delicious and amazing in coffee. Silk soymilk mint chocolate sounded like something my girls might like (since they love Westsoy’s mint chocolate soymilk); so I gave it a try. 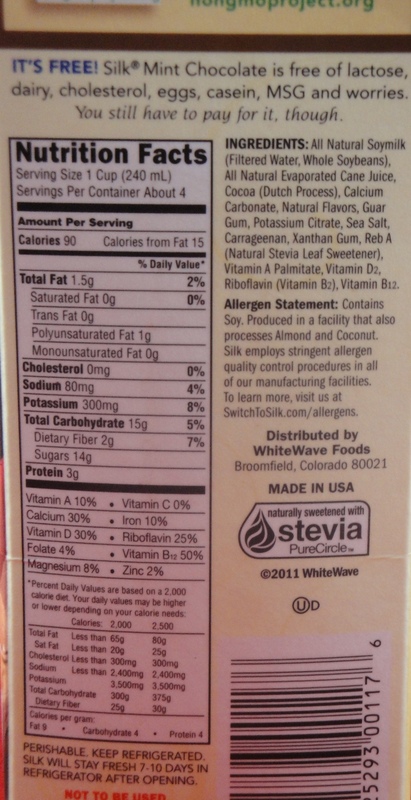 I did not look at the ingredients or label closely and later realized that it was sweetened with Stevia. Stevia tends to be bitter and have a lingering aftertaste. I was hopeful that this product would taste good, since it was the Silk brand and it contained evaporated cane juice as well as Stevia. Silk soymilk mint chocolate is pretty good as a cold beverage: creamy, sweet, nice mint flavor, low soy notes; but it is lacking in fullness & chocolate flavor. Unfortunately, my daughters don’t like Silk chocolate mint soymilk and will not drink it. I believe the higher level of sugar, fat and salt in the Westsoy product adds to the fullness that is missing in the Silk beverage. The biggest differences nutritionally between the two beverages is: Silk has 90 calories per 8 oz and Westsoy has 180 calories per 8 oz. If my kids were dieting, I’d be concerned. My main goal at this time is getting them to school with some protein and nutrition in their bellies. 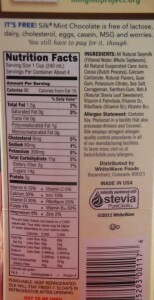 Silk has only 3 grams of protein per serving, while Westsoy has 7 grams. My kids will happily drink the Westsoy product, but not the Silk product. I would have rated this product as admirable if I hadn’t tasted the Westsoy product first. Because of that and my frustration with the fact that my kids won’t drink it, I’d have to say Silk soymilk mint chocolate is ordinary. Even if I end up dumping the rest of this quart down the sink, I still feel good about my Silk soymilk purchase. That is because I logged into www.shareyourdelight.com and entered the UPC, Silk will now make a $0.50 donation to a kids charity. That’s very generous.